The purpose of this on-line study-guide and course-outline is to make text and visual materials on the arts of Burma readily and inexpensively available, in particular to students and teachers. These materials assume college level reading skills so that the contents may be used for independent study courses, as a resource for teachers in secondary schools, as well as anyone interested in expanding and enriching their knowledge of the Arts and Cultures of Burma. Because the text is written for a general audience it does not contain the detail or footnotes that are found in scholarly publications. A select bibliography is provided at the end of each section for those who wish to pursue topics previously discussed. The illustrations are digitized from my own collection of color slides with the several exceptions noted. The importance of presenting this data electronically, is that published information concerning the arts and culture of Burma is not easily obtained. To date, there is no readily available comprehensive survey. Those studies that have been published are often out of print, expensive, or poorly illustrated. Therefore, this course intends to offer a summary of the research that has been completed together with illustrations of major buildings and sculpture. The intent here is not to be encyclopedic, but to describe and illustrate the major developmental phases in the arts of Burma. Because religious and cultural practices inspired and continue to inspire most of the arts of Burma, sections describing the belief systems and history of Burma are included. These discussions are intended to make the art forms more intelligible to the novice as well as to the more advanced student. The themes of the course follow the chronological development of the major visual art forms of Burma as they have been reconstructed from an incomplete archeological record and very limited written records. The study of archaeology and art history is not well developed in Burma so that benchmark dates and facts are not abundant. Patterns and themes that are at present discernible will be traced through five major periods. General characteristics of each period are discussed at the beginning of each section. I thank the United States Department of Education and the National Security Educational Program for a three-month grant that made this project possible. I am indebted to Dr. Susan Russell, Director of the Center for Southeast Asian Studies, Northern Illinois University, for her support and encouragement in writing the NSEP and Title VI grant proposals and to Professors G.M. Henry and Robert Zerwekh, Department of Computer Science, Northern Illinois University, for their considerable effort and patience in putting this manuscript into an electronic format. I wish to thank Dr. Thecla Behrens Cooler for her inspired criticism and editorial assistance. Jessica Rhinehart, Nita Purawan and Gregory Betzel gave needed assistance in the process of slide digitization. I thank Dr. Michael Aung Thwin for providing me with a copy of his compact disc, The Making of Modern Burma, before it was available to the general public. In many ways The Making of Modern Burma (now available from cseas:@hawaii.edu) is a useful companion to this web course on Burmese Art and Culture. Burma, also known as Myanmar, has the largest land mass of any country in mainland Southeast Asia and in size is comparable to the state of Texas. It is situated between and shares long borders with two of the world's great superpowers, India and China, as well as having an extensive border with Thailand. For a relatively short distance, Burma also shares a border with Bangladesh. In form, the country resembles a diamond shaped kite with a long tail. From the peak of the kite in the north to the southern end of its tail, the country extends 1,275 miles. At its broadest extent from east to west, it measures approximately 580 miles. The dense jungles, long distances, and extended mountain ranges between Burma and its powerful neighbors, India and China, have provided a natural barrier to foreign military invasion. (The Mongol incursions around the year 1287, credited with ending the Pagan Empire, are now thought to have penetrated only into northern Burma and did not succeed in capturing or occupying the capital city of Pagan. The incursion did serve from afar to topple an already weakened government.) Therefore, the Indianizaton of Burma and, particularly the adoption of art forms connected with Buddhism and Hinduism, was a peaceful and internally motivated process. 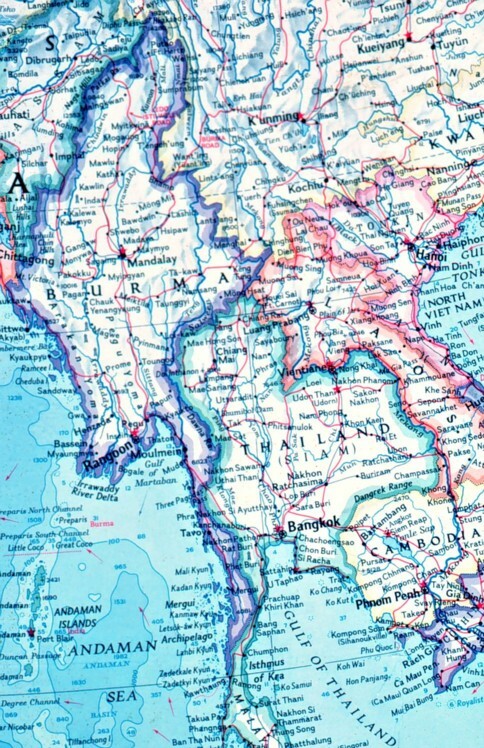 Burma and Thailand have often been at war, having regularly plundered each others capitals, and for relatively short periods they colonized portions of the others territory. Otherwise, with the exception of the British Colonial period that ended with the close of World War II, Burma was not long dominated by foreign powers and has had a generally continuous development over time. Burma is a naturally formed geographical unit consisting of a vast central plain surrounded by three mountainous areas to the north and by the Bay of Bengal and the Andaman Sea to the South. There are four major land divisions: the large central plains area is encircled by mountains and plateaus; along the west and northwest by the Arakan Yoma (mountains) and Chin Hills; along the northern border by the Kumon mountains; and along the northeast and eastern borders by the Shan Plateau and attendant mountains. Two major rivers, the Irrawaddy and the Salween, flow southward across the central plains. The Irrawaddy is Burmas longest and most important river and a succession of Burmas capitals were built within a short distance of its banks. 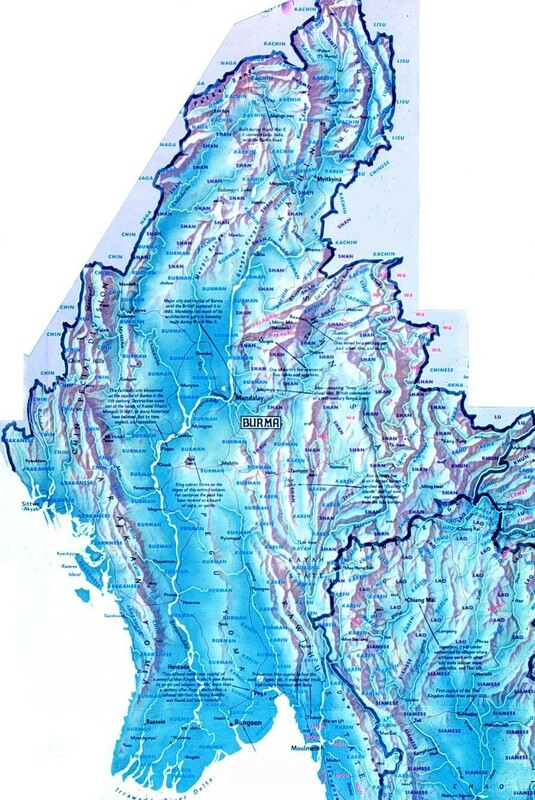 To the east of the Irrawaddy, the much shorter Salween River drains the Shan Plateau and empties into the Gulf of Martaban between the ancient cities of Pegu and Thaton. Because the Irrawaddy river is navigable for most of its length, it has served throughout history as the countrys major transportation route for communication, trade, and warfare. Additionally, it has assisted in keeping alive the memory of earlier civilizations so that successive Burmese polities up and down the river have often asserted their legitimacy by demonstrating connections to earlier kingdoms. Interestingly, the depth of these connections is far greater in Burma than for other countries of mainland Southeast Asia. The Irrawaddy, including its considerable tributary, the Chindwin, drains approximately three-fifths of the country's surface terminating in a broad delta below the modern capital, Rangoon (Yangon). Fertile silt from the Irrawaddy has continually expanded this delta area that gained in economic importance over the last two centuries as it was cleared for the production of irrigated rice. Rangoons riverine location near the Bay of Bengal provided the British with a seaport through which to govern their colony. Until today, Rangoon has remained the capital and center for political and economic activity, whereas Mandalay, built in the nineteenth century and the last royal capital, has continued to be a major center for fine arts and education. Paradoxically, irrigated rice was first cultivated in the central dry zone and until the present day it has continued as a major center for rice production. Despite the lack of rainfall, extensive irrigation has been possible because water was diverted into canals and weirs from tributary streams before they enter the Irrawaddy. Water from the Irrawaddy River itself is not readily available for irrigation because the water level remains far below the surrounding countryside for much of its course. The wealth produced by intensive rice cultivation in the dry zone supported the ambitious building programs and patronage of the arts that is evident in the remains of the capital cites that were situated along its banks. 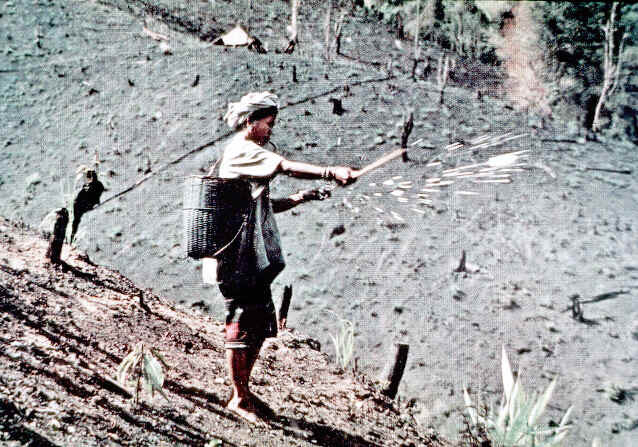 The Burmese refer to the dry zone as Upper Burma, even though it is geographically in the middle of the country. It was here that the Burmese ethnic group first settled and it was here that most of the Burmese capitals were subsequently built, including Pagan, Sagaign, Ava, Amarapura and Mandalay. 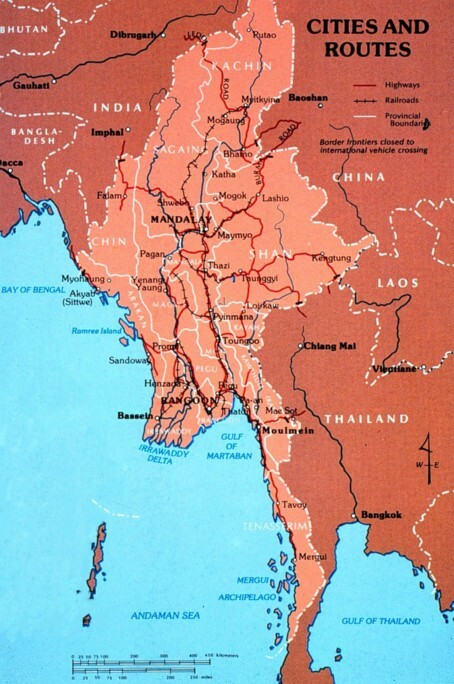 Rangoon and the delta are referred to as Lower Burma, an area that gained in political and economic importance during the nineteenth century as a response to Britains need for a seaport-capital from which to govern its colony. Since Burma stretches into the northernmost reaches of Southeast Asia, much of central and northern Burma has a temperate climate although the southern third of the country is quite tropical with heavy rains and high temperatures. 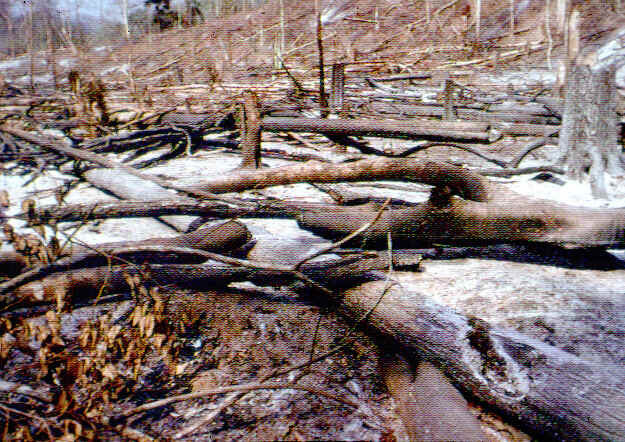 A mere fifteen percent of the soil in Burma is arable. The disparity in soil fertility between the fertile central plains and the relatively infertile mountainous areas has defined not only an economic but also a marked cultural, religious, and language difference between the lowland peoples and hill tribe groups. The lowlanders typically are rice farmers, speak Burmese (or in the past, Pyu or Mon) and are adherents of Theravada Buddhism. Eighty five percent of todays lowland population practices Buddhism. The hill tribes typically engage in swidden or slash-and-burn agriculture, speak a non-Burmese language, and practice one of the many forms of Animism. Western missionaries have been successful in converting only members of the hill tribe groups, so that today, for example, there are hilltribe Karen who are Christian as well as animist. Burma is one of the least densely populated countries in Asia having a population of 40 million that is concentrated in the arable plains bordering the Irrawaddy and Salween rivers. Burma is one of the most linguistically diverse countries in Southeast Asia having more that 100 indigenous languages spoken within its borders, although Burmese is the common and official language. Three ethnic groups, the Mon, the Pyu, and the Burmese have made the greatest contribution to the development of the arts and culture of Burma and they all settled in the central plains along the middle and lower reaches of the Irrawaddy or Salween. The Mons are the earliest identifiable group to inhabit Burma and lived along the eastern coastal regions centered about the ancient city of Thaton. Although little is known about their origins or when they first settled in Burma, their language belongs to the Mon-Khmer family; similar Mon speaking groups settled in Thailand and Cambodia. Since the Mons occupied areas adjacent to the coast, it is not surprising that they were the first group in Burma to be influenced by Indian ideas. The Mons were the first to adopt the Indian religions of Buddhism and Hinduism. Mon myths tell of two Mon brothers who visited India and received hair relics from the Buddha. The two brothers returned to Burma bearing their precious gifts that were encased in what has become the most revered Buddhist monument in Burma today, the Shwedagon, located at the center of the present capital, Rangoon. The Pyu Peoples settled areas located inland to the north of the Mons although some few communities may have been interspersed among the Mon. The Pyu lived in walled cities, the largest and most important being Srikshetra, located not far from the Irrawaddy, near Prome. Pyu, the language of these people, belongs to the Tibeto - Burman family of languages, as is Burmese. Therefore it is believed that when the Burmese moved south and conquered the Pyu, they were easily absorbed into the Burmese population. In any event, the Pyu are rarely heard of after the quadralingual Myazedi inscription of 1113 AD and today there are no Pyu speakers. At some time after the fifth century, the Burmese people moved South down the Irrawaddy settling along the Irrawaddy but importantly around the bend of the Irrawaddy where it makes a major eastward turn. This area, known as Kyaukse, became the Burmese heartland and is where irrigated rice was first extensively cultivated. By the 8th century, the Burmese established what was to become their most important city, Pagan, which was located at the second major bend in the Irrawaddy where it turns and flows southward to the Bay of Bengal. Today, about 70% of the population occupying the central plain are ethnic Burmese.